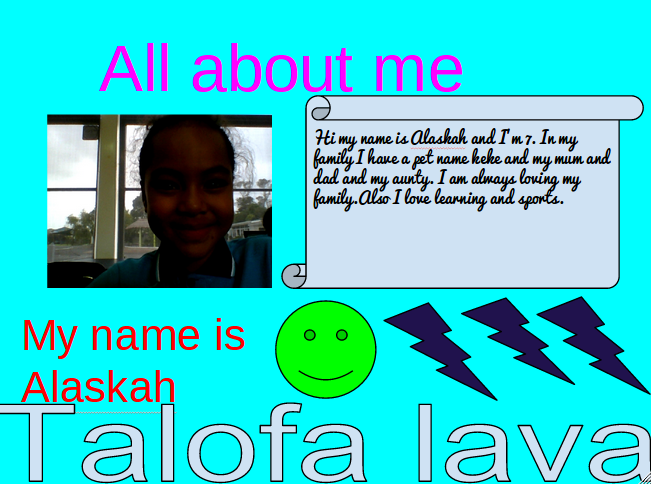 In our class we have been learning to use Google draw to create posters about ourselves. Great work FLOX!!! I love your work already...and now you're LIVE!!!! WOOP WOOP x I cannot wait to see what else you will get up to this year. Keep smiling and kia kaha. I love your All About Me page it looks brilliant. I hope you start blogging more pages. I wonder how you took a picture? Keep up the great work! I love the way you have your presentation clear for people to see. I like your choice of colours I love your smile and I Love the writing you chose. Keep up the fantastic work. I like the way you put so much effort in your learning. I love your lovely work.